Excellent mattress so far, great price,delivery was prompt would recommend. This mattress set goes beyond basic, delivering the quality, support, and comfort you require at an affordable price. The plush comfort is bolstered with an innerspring system for exceptional full-body support with ease of movement for that sleep-on-top feeling you crave. Exclusive Posturepedic Technology delivers stable all-over support with reinforced support under the heaviest part of your body for optimum alignment. Please note: Mattresses and mattress sets are non-returnable upon signature at delivery. awesome mattress, my son sleeps so comfortably on it, it is plush and comfy just like the description and it is easy to get a good sleep on it. I feel much better knowing my kids are sleeping on a solid but comfortable mattress. The price is fantastic for such a quality mattress. Definitely recommend! I really love this mattress set. It’s soft but with great support for my bad back. I like a mattress set that is not only supports me, but is pretty as well, and this even matches my decor. Very high quality than I expected. When I got the delivery, the team put it upstair for me. Smell is very bad, I had to leave it at another room for 2 days to get the smell away. The third day, I went to the room to check if the mattress is fine. I carried back to my room and tried sleep on it. I felt really comfortable, I have a back issue, but slept on this mattress giving my life back to normal. The delivery team was awesome and courtesy. Would recommend to my family. This mattress was purchased to be used in a guest room with a platform bed and headboard also purchased from O. The height of the mattress was recommended by a reviewer so as to not cover the upholstery. While I would have purchased a thicker mattress, it is quite comfortable. A medium firmness, it is not too soft or hard, and I think it will appeal to a range of preferences. The price was very competitive. I had seen the same one in our local department store, but with delivery, it could not complete with "O's pricing. Great value for the price, very happy with the mattress. It is a plush mattress as described and delivery was quick! We just received this mattress yesterday and my dad loves it. It is on the firmer side so we plan on getting him a more plush mattress cover. We're very pleased with this purchase. I bought it for my son’s new bed. He loves it and sleeps very well every night. It is nice and plush. It is great bed for the price. I will recommend. Very comfortable and fits like a dream on our full size bed in our small guest bedroom. Affordable and definitely recommend product for the price. Comfortable and nice for the price! This is comfortable to sleep on and we enjoy the pillow top effect. "Does this come with a box spring"
No, this is the mattress only. "Can this mattress be used on an adjustable platform? " No, these are not recommended for adjustable bases. "Can I use it for my full size daybed ? " We would advise using the full size mattress for a full size daybed. "What is the coil count in this mattress please?" The coil count is 638. Thank you for your interest in our Sealy Products. 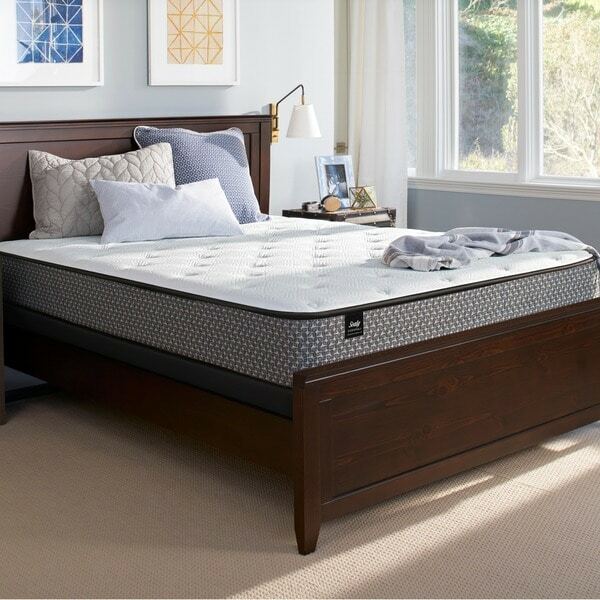 We recommend rotating the Sealy Response Essentials 10.5-inch Queen-size Plush Mattress periodically. "Can this mattress be used with a daybed?" Does this mattress come in a box?